How to maximise the impact of the Innovation Challenges? What’s the best way of strengthening private sector engagement? How can Mission Innovation (MI) support clean energy ideas and innovators? These are some of the key issues delegates attending the 3rd Mission Innovation Ministerial (MI-3) Preparatory Meeting addressed in Ottawa. The objective was to generate new ideas for an inspiring MI-3, able to deliver concrete results and show MI progress and impact. 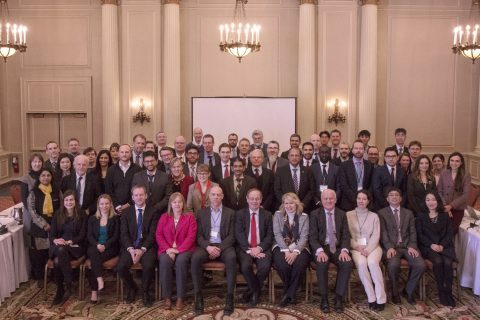 Delegates from 23 countries met in Ottawa from 30th January to 1st February 2018 to set an ambitious agenda for the upcoming MI-3 in Malmö. Tangible progress – MI-3 will take stock of progress towards the doubling target and across all the seven Innovation Challenges, showing, through case studies and infographics, how MI is producing genuine added-value. Private Sector engagement – Strengthened private-sector engagement emerged from the preparatory meeting as an ongoing priority. MI-3 will have a strong focus on unlocking private sector investment, as well as enhancing collaborations and initiatives amongst stakeholders. Collaborations with the Breakthrough Energy Coalition and the World Economic Forum will be further enhanced as natural follow-ups to the One Planet Summit and the WEF in Davos. The Ministerial will pave the way towards MI-4 in Vancouver and beyond. New members, key international collaborations and public-private investments and initiatives are expected to be announced in Malmö. Of key importance will be bringing together Ministers and high-level private sector stakeholders to discuss how to concretely accelerate clean energy innovation in specific technology areas through public-private engagement, as well as bringing to the fore initiatives and collaborations that seek to support and celebrate breakthroughs in clean energy innovation. A number of stimulating and engaging side and fringe events will take place around the Ministerial. This will include the Solutions Summit, to celebrate breakthroughs, ideas and innovators emerging from and supported by MI members RD&D investments and specific workshops related to the Innovation Challenges. Check out the Nordic Clean Energy Week webpage to see all of the events planned around the Ministerial. A dedicated CEM9- MI3 Ministerial website will be launched in March to share information about the event, registration process and promote an innovative and inspiring Ministerial.